It looks like every Hearthstone tribe is taking part in Rastakhan's Rumble, since we've seen Pirates, Beasts and Dragons so far and now it's time for Murlocs! The reveal happened one hour earlier than it was supposed to. 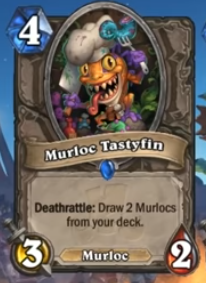 Murloc Tastyfin was unveiled by TheFishou in a YouTube video in French. The Elven Minstrel (sort of) of Murlocs feels like a very slow card for the usually aggressive Murloc decks. You will have to sacrifice tempo to play this and since it's a Deathrattle, it is very weak to Silence. There's also the fact that currently in Standard there aren't many competitive Murloc decks. Mage and Shaman definitely have better ways to draw cards. With all the tribes appearing in Rastakhan's Rumble, Murlocs don't seem to be very big players and it's doubtful if we will see more Murloc support cards unveiled for this expansion. Perhaps Murloc Tastyfin can find a spot in Wild, where Murloc decks are at least encountered more often. I’m playing murloc paladin in standard to finish off gold pally, it’s still alright; made it to legend last season but stalled a bit a rank 3 right now. Personally don’t think you’d run it in this (we have call to arms to ‘draw’ on turn 5 anyway) or any other murloc deck. If it was battlecry, sure. Or if some big murlocs that don’t require other murlocs got printed. This kind of card is good as tutor in combo deck, mostly. We should wait for some big murloc to see this shine. I would play it in my murloc hand-buff midrange paladin, because it help not to finish cards in hand; but do I play that kind of deck anymore?